Yesterday I have corrected a bug for COOP or DIE. The new version 0.5d is available. The bug was related to a crash when entering the "Launch Command" map, more information could be read here. 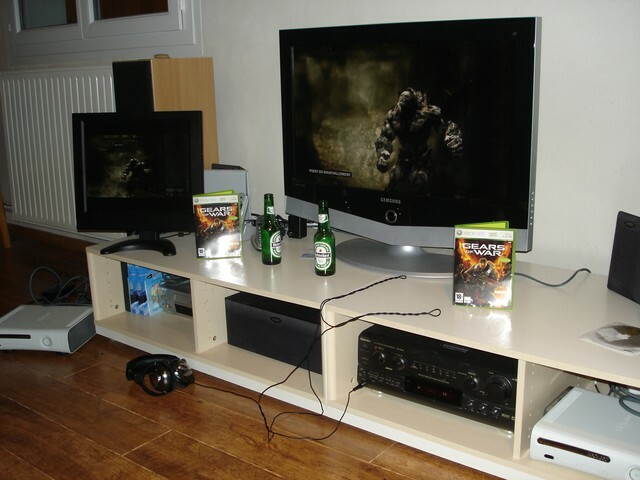 Yesterday, my neighbour and I started the 'Gears of war' campaign. For our first try out, I've used my XBox360 and a 17" screen for playing in his living room. We will probably continue the game through XBox live. Our first impression was very good. It's cool to see a game really designed with cooperative play in mind. I like the 'Y' key that automatically turns your character to the direction of your teammates, cool for quickly retrieving him! The visual aspect of this game has reached a new level. The continuous flow of game-play sequences and in-game cinematic is really topnotch, particularly on a 32" HDTV ! Step by step the idea make its path: the Tremulous standalone game could be a very good start for my next COOP or DIE development. The GPL Quake3 engine and game content licensed under Creative Commons Attribution-Sharealike fit exactly my needs. I'm currently learning GtkRadiant and working on a map for Tremulous. I also thinking about a little game modification, something like the COOP or DIE H.U.D. mixed with the Enemy Territory Fire-Teams features. I use them for detecting cheat or exploit (only for the challenge mode). I also use them for debugging. After the release of the 0.5 version, I have added too much debug information, and the result was a big grows of these files. The size limit of my web space was reached at the start of the November month. The main consequence was for the web-chat, the messages file wasn't enable to be rewritten, and the chat was broken. All work fine now, and I have reduced the verbosity of the log! The next step for COOP or DIE is now to merge the player database of the WorldServer with a PhpBB forum. In the future, players will have to register to the forum for creating their account. The actual register PHP code will be removed and the new forum will be hosted on the COOP or DIE website. But before starting this work, I will make a little break. Working on the COOP or DIE Quake2 modification is cool, but for maintain my motivation I must look at something a little more challenging. 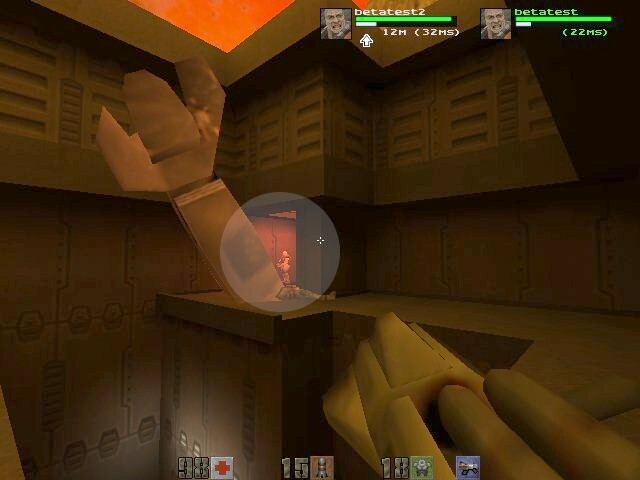 These days, I have started to play with the Quake3 code of the standalone game Tremulous. I have already implemented a worldserver for Quake3 in the past. But it is not the current purpose. 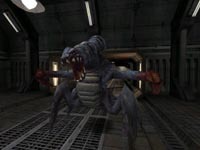 I want to improve my Quake3 code knowledge, and evaluate the possibility of creating a single-player (and coop) mode for Tremulous. Of course today I can test COOP or DIE on-line without enabling cheats for all users ! The "Crash n Massacre" and "Rush for the Head" special missions have been re-arranged and are now available directly from the StartMap. If you haven't already tried these goodies created by Crusard, it's time to do. They does it in the way it was meant to be ! During the QExpo, the team composed by zorg and GONZO has beaten the entire game in challenge mode. They have fought side by side, helping each over, until they have slayed Makron. Regarding the WorldServer log file, the hottest moment was in "Outer Courts" during mission 9, when GONZO was only 18 health points left!!! I must admit that it is a hack and not a clean correction. The difference now is that I have understood the real nature of the problem. The Quake2 server stores multiple command orders before sending them to the WorldServer. The problem comes from the fact that server state can change between the time the command was ordered and the time it is computed and sent. It is particularly true during level loading and depends of the computer speed. Like the inventory and map progression are saved on WorldServer at each map change... the problem is here!!! The 0.5c version will allow gamers to play without trouble during my holidays (until 23 of July). I will rewrite a big part of the WorldServer RPC call after that. Some players have experienced a bug related to inventory and map progression saved on the WorldServer. I have corrected the bug and enhanced the log system for better error reporting in the future. The QExpo 2006 website is near to be launched. Unfortunately I will be away from 14 til 23 of July. But I will take a booth and you can expect some fun bonus before the end of the expo. 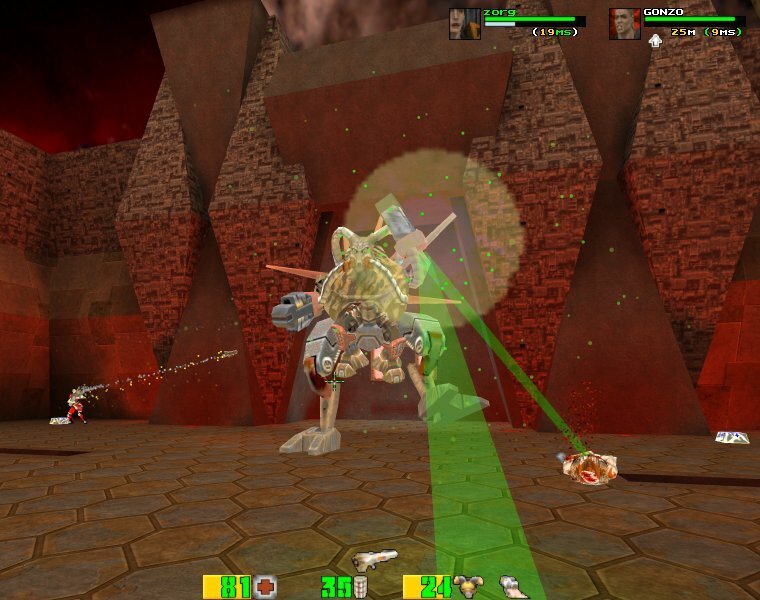 COOP or DIE is back to its original form: a DLL only Quake2 modification. The download size is greatly reduced (483 Ko) and you can now choose the engine of your choice. I will make a break in coding for the next weeks and work on a little bonus released during the QExpo 2006. After that, the work will restart with a new objective: merging the WorldServer registration and account system with PhpBB. Here is a screenshot of my desktop during the test of the last 0.5 version of COOP or DIE. During a long time when I wanted to test multiplayer I used to run the game on my 2 computers. But finally I prefer to run 2 instances on the same computer. I haven't noticed any side effect and it is a lot more useful. This is probably why the last release is so long to come. 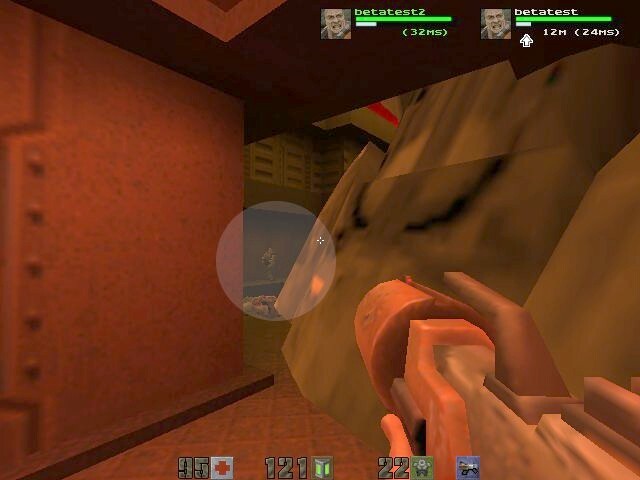 I have noticed and corrected a lot of bugs related to the WorldServer and multiplayer Quake2 interaction. I will release it rapidly and start to work on the QExpo bonus. Some new feature will come later in a 0.5b version. The DLL part is done and currently tested. Don't be surprised if you see some people connecting to the worldserver with engines like R1Q2 and EGL. In addition to my account betatest, I have allowed the accounts of the two German players zorg and GONZO, to test the stuff. The release is for soon, I currently clean up some PHP code on the WorldServer side, and when it's done ... it's done. There are some rumors about a QExpo this year for celebrating the 10th anniversary of the first Quake's release. The date seems to be July 17 till 27. If so, I will request for a booth and probably release some special stuff during the event. I think about something in the spirit of the punishment map... stay tuned! Quake2maX v0.44 and EGL v0.3.0. The game doesn't work properly with R1Q2 and crash with Quake2 Evolved. I will investigate a little more before releasing the stuff. The bug that cause sometime teammates to spawn on same position has been corrected. It's part of the new version planned to be released soon, but like it's a worldserver patch, it is already in use. I have also corrected a bug related to friendly fire, but it will be available on next release. Yesterday I conducted a multiplayer test with my 2 PC. There are some little corrections to apply, then it will be possible to release to whole stuff. The worldserver will be closed for maintenance a few hours during the upgrade. The main feature of this release is the return to the old "dll only" scheme. So, everybody will be able to use the engine he wants, from the initial software rendering engine to actual eye-candy engines. Rarely a multiplayer game has hooked me so quickly. The game-play is really cool and the tutorial mode with shortcuts displayed on screen help a lot at the begining. The stand alone version of Tremulous was released ! Even if I was on vacation and skiing, I have used the hotel's Internet facility and taken a look at the Tremulous home page the day of the planned release. So, here it is, the standalone version is available. So what are you waiting for, go, download and play ! All existing code has been removed from the KMQuake2 Dll and re-implemented on a standard Q2 Dll. I have successfully tested it on-line with the stock Quake2 engine and with the Quake2maX engine. 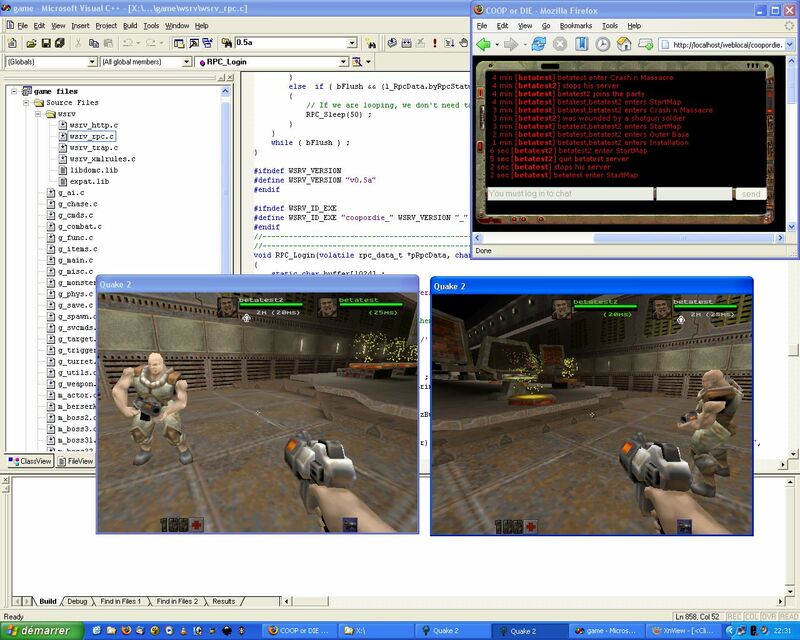 I have also tested with the EGL engine and with the Quake2 Evolved engine, but without success. I've got an incompatibility error with the first and a crash with the second. I will investigate these issues later. Even afters years without new release, COOP or DIE continue to brings some new players. The limit of 2000 registered players has been reached during the last month, and I must admit that it is always a pleasure for me when I look at the website and peoples playing. A new champion named Haunted has beaten the game in challenge mode last week and send me some screen-shot of his performance. I have added a little enhancement to the worldserver, now players who want to play alone can do it without the risk to lost their progression if someone join them. I will also release a last version of COOP or DIE. It will be a cleanup and a return to the dll only form. It will be possible to use the engine you want, like in the past. Plan for the future are no defined, but the idea to create a new COOP or DIE franchise become to take its way. 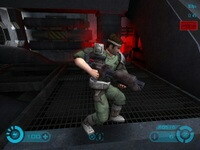 The plan is open; I could modify a recent game like DOOM3, Quake4 or the upcoming Quake wars. It could also use the Quake3 GPL engine and maybe make a deal with a team that has already enough content for creating a standalone game.